Photo taken c1905. Looking eastwards along Yokecliffe. A lead vein called Yokecliffe Rake ran from Wirksworth to Brassington near here and there were many old mineshafts in the area. The largest was Yokecliffe Mine. 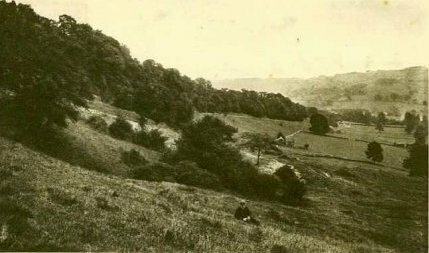 The view from the top of Yokecliffe, from a postcard. The road in the left foreground is Yokecliffe Lane. Gilkin and Breamfield are on the extreme left, the hamlet of Gorsey Bank on the right and the Meadows and Water Lane are in the centre of the picture. Today most of the fields to the centre and right of the picture are full of houses, built since the First World War. The town's windmill stood hereabouts. Posted 1910. 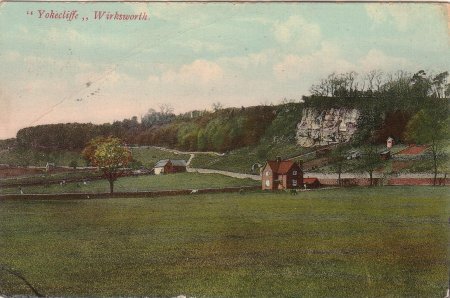 Addressed to: Annie Melbourne, 13 Gorsey Bank, Wirksworth. John - If you look at the aerial map and ordnance survey map. On the OS map you can see Warmbrook and then Yokecliffe Farm. 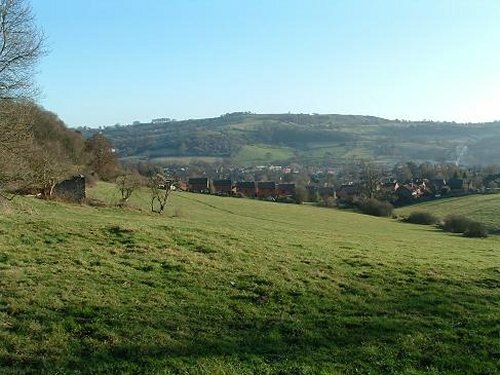 The area that the photo is showing is Yokecliffe not Youlcliffe. I used to go walking there when I was younger, sorry much younger. I have always known it is Yokecliffe. The path shown to the left by the trees is still there, as is the lower one ( see os map), but there are now houses where there used to be fields. These are shown quite well on the aerial map. I still live in the house I was brought up in, and I can see Yokecliffe from it. I have the OS reference it is SK277538. There is a website to check this and it seems to be spot on (Multimap) www.multimap.com I thought it would be a good idea to send you some digital jpeg photos (3) of the nearest views I could find to the original. There are trees perhaps where the original was taken and they would obscure the view, but I have tried to one of them as near as I can to the original. Well here they are. It was a beautiful clear day this Sunday morning about 11am when I took them. 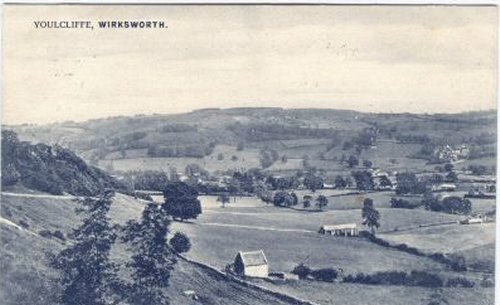 It also brought memories back The paths are still there and you can approach the tremendous views down the Ecclesbourne Valley towards Duffield and Derby from the footpath sign on the left hand side on the Wirksworth to Ashbourne road just past the summit near a farm. You can see Carsington Water in the Distance from the Footpath sign to pinpoint it.